The following information is taken from: Desription and Rules for the Management of the Springfield Rifle, Carbine and Army Revolver, 1874. 1st. 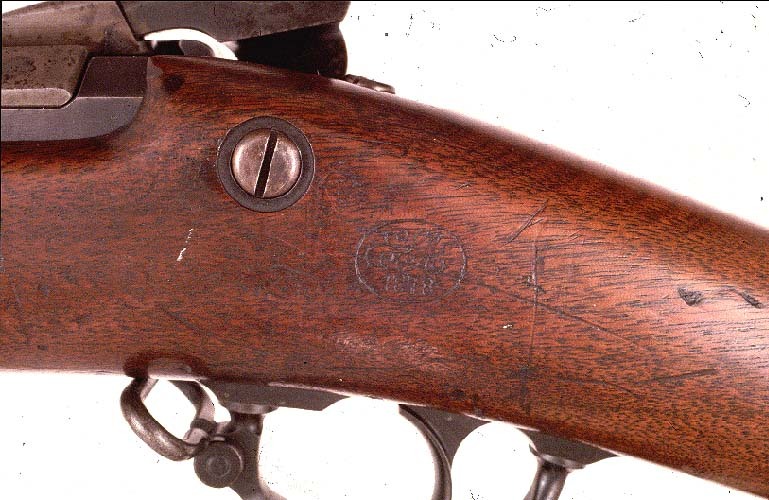 The barrel has been made of low steel instead of iron, and the caliber has been reduced from .50" to .45". The rifling consists of three plain concentric grooves equal in width to the lands, .005" deep, with a uniform twist of one turn in twenty-two inches. 2nd. The lock plate has been reduced in thickness, and has no bevel on the edge. 3rd. A rounder shape has been given to the hammer. 4th. The heads of the tang screw, tumbler screw and side screws have been rounded off, and the side screws have been slightly shortened. 5th. A screw has been substituted for the rivet of the guard bow swivel. 6th. The shape of the rear sight has been changed, and it has been set further forward on the barrel. 7th. The metal parts of the rifle have been browned or blackened. 8th. The stock has been rounded off near the lock plate, and on its upper edges, as far forward as the lower band. 9th. A number of cannelures have been cut near the small end of the ramrod, in order to give a better grip to the fingers in using it. 10th. The shape of the upper band and of the gun sling swivel have been changed, and an open or stacking swivel has been added for the purpose of stacking arms without using the bayonet.